A free newspaper has returned to the heart of the community it serves after a 20-year absence with the opening a new office on its patch. The Barnet Press has relocated to the North London suburb from the neighbouring borough of Enfield after an “exile” of some 20 years. For most of its history, the Press was based on Barnet High Street, but it has been operated from various bases in Enfield since the early 1990s after being merged with the Enfield Gazette Series. Now its new premises on St Albans Road have been officially opened by the Mayor of Barnet, Brian Schama. Now part of the Tindle Newspapers group, the Press series was first established by the Cowings family, who lived in nearby Arkley, in 1859. It also includes the Barnet & Potters Bar Press, East Barnet Press & Advertiser, Hendon & Finchley Press and Edgware and Mill Hill Press. After relocating from the High Street to Sapphire House, in East Barnet, in the early 1990s, it moved to Silver Street, Enfield, in 1997, and then to Refuge House, Enfield, until earlier this year. The Enfield Advertiser & Gazette series has also moved to new offices in Baker Street, Enfield. 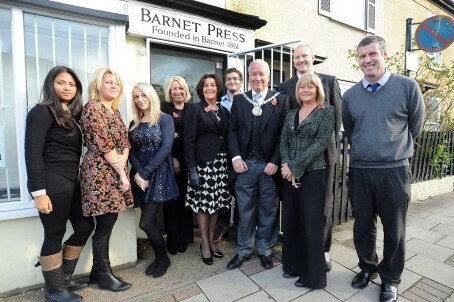 Pictured below are Mayor of Barnet Councillor Brian Schama and his wife Lynda (centre) with Barnet Press staff members, from left Jacqui Bumstead, Jemma Baldwin, Stacey King, sales manager Claire Yates, reporter Daniel O’Brien, editor in chief Greg Fidgeon, publishing director Alison Cruse and Paul Franklin. that’s good to hear when some newspaper companies insist on running local papers like clones from many miles away. They are the ones currently dropping thousands of sales.